Green Express Train is a reputable railway company that provides top luxurious and professional train service from Hanoi to Sapa and vice versa. This train has 2 carriages. Each carriage has 7 cabins 4-berth. 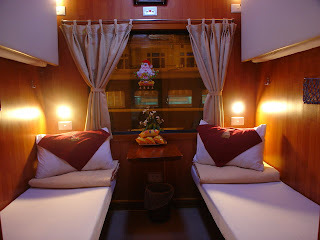 Every cabin, which is wood-paneled inside and decorated with noble wood furniture, include individual reading lights, baggage storage, bottled water, fresh wipes, toothpaste and toothbrushes,. It generates an atmosphere of coziness, glamour and high class to the customers. 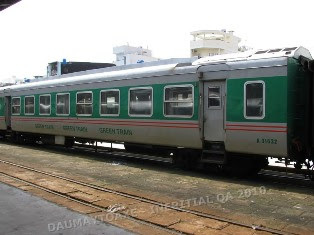 Green express train: Especially, Green train has two toilets at either ends. Moreover, if you go to sapa by group of friends, you can book a ticket in 6 berth cabin with lower price. Children from 5 to 10 years old, shorter than 1m2 = 70 % adult fare (sharing bed with parents), = 100% adult fare (own private bed) ".